Marc Anthony, Will Smith and Bad Bunny kicked off the Latin Grammy Awards with a performance of their racy single “Está Rico"
Jorge Drexler accepts the award for song of the year for "Telefonia" at the Latin Grammy Awards on Thursday, Nov. 15, 2018, at the MGM Grand Garden Arena in Las Vegas. Uruguayan Jorge Drexler owned the Latin Grammys on Thursday, picking up three awards including song and record of the year for "Telefonia" at a ceremony where other stars used their platform to promote messages of unity and justice. 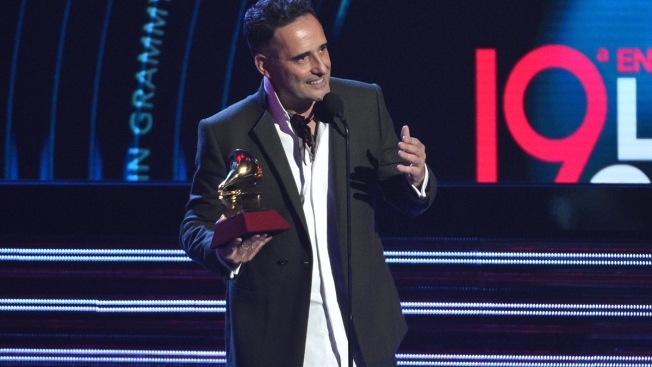 Drexler also won best singer-songwriter album with "Salvavidas de Hielo." Spanish sensation Rosalia followed him with two awards, best urban fusion/performance and best alternative song, for the flamenco and trap hit "Malamente." "I do not know what to say," Drexler said when receiving the last award of the night for "Telefonia," which he also played during the ceremony with Mon Laferte, Natalia Lafourcade and El David Aguilar, all playing string instruments. Rosalia said she owed her success to flamenco, which she described as her "foundation," and dedicated her awards to her brother and other women in the music industry who have "made her take strength." "I'm not going to stop fighting until I see the same number of men and women in the studio," she said. "Without them, I wouldn't be here." Colombian reggaeton star J Balvin walked the red carpet as the evening's nominations leader with eight nods, but took home only the trophy for best urban music album. The Latin Grammys are known as an awards show where artists take political stands. During the show and in backstage interviews, artists alluded to such topics as immigration and violence affecting several countries. "In these times of crisis, art becomes a medium that reminds us of the urgency of justice and the need to find solutions that invite unity ... tolerance and inclusion," host Ana de la Reguera said before norteño group Calibre 50 performed "Corrido de Juanito," which tells the story of a man who immigrated to the U.S.
Mexican rock band Mana, honored Wednesday as the Latin Recording Academy's Person of the Year, also took the stage performing a medley that included its hits "Labios Compartidos" and "Clavado en un Bar." The academy bestowed the honor on the band for its achievements and contributions to the Latin community and support of environmental protection and human rights causes. "We will continue fighting for the rights of the immigrants who have made this country great in the last century," lead singer Fher Olvera said, referring to the United States. "They were the difference for this country to be as big as it is. We will fight for Mother Earth, we will fight for women's rights and we will continue fighting to make songs from the heart and soul." The band took the opportunity to announce that after two years without playing live, they will start a world tour next year. Marc Anthony, Will Smith and Bad Bunny kicked off the night with a performance of their racy single "Esta Rico." Laura Pausini won for best traditional pop vocal album with "Hazte Sentir," while the trophy for best salsa album was given to Victor Manuelle with "25/7." "Daddy, this is for you," Manuelle said looking up after mentioning his father's death earlier this year. The coveted Latin Grammy for best new artist went to Karol G. She defeated nine other artists, including Angela Aguilar, Anaadi, El David Aguilar and Alex Ferreira. Most of the night's awards were presented during a pre-telecast ceremony. Among those who walked away with trophies were Lafourcade for best folk album with "Musas (un homenaje al folclore latinoamericano en manos de Los Macorinos), Vol. 2," Aterciopelados for best alternative album with "Claroscura" — their first album in a decade — and Linda Briceño, who became the first woman to be honored as producer of the year. "I am very grateful," Lafourcade said after receiving her trophy. "I want to dedicate this to Mexico, to Latin America, to all our brothers who are arriving to Mexico, who come from many places, that are going through difficult times. Our hearts with you." Absent from the ceremony, the extremely private Luis Miguel won the award for album of the year with "¡México por siempre!" defeating an eclectic group of established and rising artists that included Balvin, Pablo Alboran ("Prometo"), Drexler ("Salvavidas de hielo"), Kany García ("Soy yo"), Lafourcade ("Musas, un homenaje al folclore latinoamericano en nanos de Los Macorinos, Vol. 2"), and Rozalen ("Cuando el rio suena..."), among others. After Thalia revealed Luis Miguel as the winner, the crowd at the MGM Grand Garden Arena had mixed reactions, with some booing and whistling because the star did not picked up his trophy. "He is not here is with us but ... hey, hey, calm down! I'm going to personally deliver it to him," she said with a wink, which served to appease the audience and generate an ovation. The 19th Latin Grammys Awards ceremony was telecast live from the MGM Grand Garden Arena.